Early in the season, it appeared that Dallastown, Spring Grove, Red Lion and South Western all had a chance to win it. But with the regular season nearing its conclusion, Dallastown has emerged as division's top team. The race for the YAIAA Division I title isn't so tightly contested anymore. Early in the season, it appeared that Dallastown, Spring Grove, Red Lion and South Western all had a chance to win it. But with the regular season nearing its conclusion, Dallastown has emerged as the division's top team. On Thursday, the Wildcats (12-2, 10-1 Division I) clinched at least a share of the division title for the first time since 2012 by beating Spring Grove, 7-0. While Red Lion (9-5, 7-4 Division I) still has a chance to claim a share, the Lions are three games behind Dallastown with four games left to play. So while it's not official, the Wildcats seem to be heading to the YAIAA playoffs. Led by star pitcher Riley Hamberger and Nick Parker and Eric Morrison, the Wildcats have the potential to go far in both the league and district playoffs. Dallastown is currently ranked third in District 3 Class AAAA. The Wildcats are scheduled to play Red Lion on Wednesday. Dallastown won the first matchup between the two teams, 2-0, on April 14. The Bobcats aren't playing second fiddle to West York this season. After finishing second in Division II behind the Bulldogs the past two seasons, Northeastern has stepped forward as the best team in the division in 2016. The Bobcats (11-4, 8-3 Division II) have clinched a share of the title and lead West York by three games with one week of the season left. The teams are scheduled to play Monday at Northeastern. Northeastern has won a mixture of close games and blowouts this season. On Monday, the Bobcats beat a solid Susquehannock team (7-8, 5-6 Division II), 10-0, less than a week after they gutted out a 2-0 win over South Western. Currently ranked third in District 3 Class AAA, Northeastern is another team that has its sights set on more than just a YAIAA title. 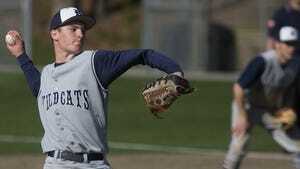 And if star pitcher and Towson commit Kody Reeser is on his game, the Bobcats will be a tough matchup. And then there's Division III. With a week left in the season, it's still very unclear which team will win the title. Eastern York (11-6, 9-3 Division III) sits in first with two division games remaining, while Gettysburg (9-5, 8-4), York Suburban (8-7, 8-3) and Littlestown (7-6, 7-4 ) are still in the mix. All have three division games remaining. A number of recent rainouts have made the division race tighter by loading the final week of the regular season with important games. And with all four teams either on the District 3 playoff bubble (Eastern York, Gettysburg) or out of the picture (York Suburban, Littlestown), the YAIAA playoffs have even more importance. Games to watch next week include Littlestown at Eastern York on Monday, York Suburban at Gettysburg on Monday and Gettysburg at Littlestown on Thursday. While the division races and YAIAA playoffs understandably receive a lot of attention this time of year, plenty of local teams that don't make the league tournament will still have the opportunity to compete in the postseason this year. Class AAAA: Dallastown and Red Lion. Christian School of York is also ranked first in Class A. But plenty can change in a week. Teams like Delone Catholic and Eastern York could easily make it in, while Spring Grove or Biglerville misses out. We'll have to wait and see what happens.